Which are the top CO2 emitting countries? This answer is from the Climate Change for Idiots series. See answers to all questions from here. Short Answer: China, United States, India, Russia and Germany are the top 5 CO2 emitters, in that order. If I asked you to guess the countries that emitted the maximum amounts of CO2, almost every one of you would have guessed the top two right – surely these cannot be any other than China and the US! 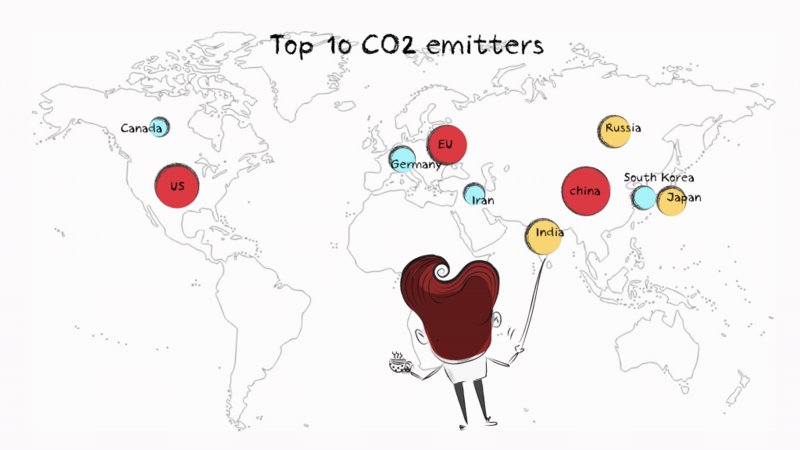 Which are the rest of the countries that occupy the top 10 list of CO2 emitters worldwide? So, the top 6 countries (including EU) alone emit about 24 billion tons of CO2, of the total global emissions of about 36 billion tons – an astonishing 2/3rd of total. Even if one removes EU from the list – as it is a region and not a single country – the 5 top emitters together emit about 21 billion tons, almost 60%! There are 195 countries in the world. Thus 5/195 countries, just 2.5%, emit almost 60% of the total emissions! Sure, the number of countries alone do not tell the entire story, but it is still something to remember – fewer than 3% of the countries emit almost 60% of the total global CO2 emissions. So: USA and China alone together emit about 43% of total global CO2 emissions, and the top 5 countries alone emit about 60% of total. « How much CO2 is emitted by the transport sector?